Greetings unto the erudite Kingdom of Æthelmearc from Mistress Alicia Langland, Chancellor of Æthelmearc Æcademy! Having received no bids for Fall Æthelmearc AEcademy and War College from groups in the preferred host region, I am now accepting bids from any group in the Kingdom. The preferred date for Fall 2017 Æthelmearc Æcademy and War College is November 11, 2017. 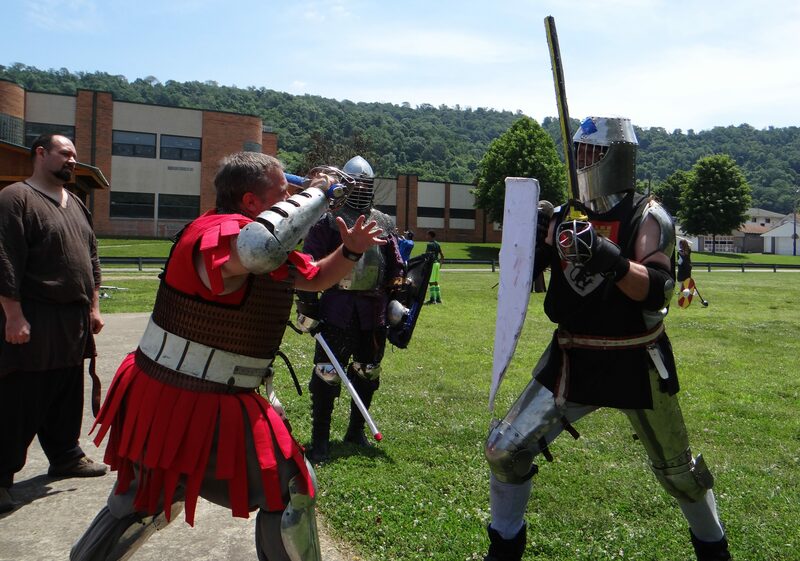 Æthelmearc Æcademy and War College is an easy event to host. It draws a sizable number of attendees, which typically includes royalty. The host group is responsible for providing the site and lunch for attendees as well as staff to run Troll. The Æcademy staff will assist with the rest! Silk banner-making class taught by Baron Friderich Schwartzwalder. Photo by Mistress Alicia Langland. If you’ve been wanting Royalty to visit your area, this is a great opportunity to bring them to you. If you have a lot of newcomers, this is a fabulous event to introduce them to the many facets of the SCA. Please remember that sites should include space and facilities for both gentle and martial arts. If your group is considering submitting a bid, I would appreciate a quick note to that effect, sent to this address: ae.aecademy AT aethelmearc DOT org. Resources for would-be autocrats — including FAQs — can be found here: http://www.aecademy.net/downloads.shtml. If you have questions or need help with putting together a bid, please let me know; I will be delighted to assist! Why are you opening up for bids when the official calendar on the kingdom web page says that the bid deadline is June 1? Shouldn’t the calendar be modified if the real bid deadline is going to be this early? This bid deadline reflects a change to Kingdom Law, as reported in the May 2015 AEstel. Some online resources have not yet been updated to reflect the changes.